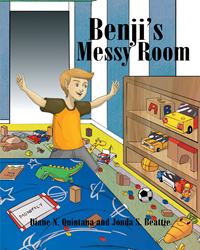 Recent release “Benji's Messy Room” from Page Publishing author Diane N. Quintana and Jonda S. Beattie is a whimsical children’s tale that teaches children how to pick up their room a little bit at a time so that they are not so overwhelmed. Diane N. Quintana and Jonda S. Beattie, both accomplished authors, have completed their new book “Benji's Messy Room”: a helpful and entertaining story that is relatable to both children and parents. Diane N. Quintana is a Certified Professional Organizer through NAPO, and a Certified Professional Organizer in Chronic Disorganization through the ICD. She is also a presenter and the author. Diane N. Quintana is a former elementary school teacher. She is the owner of DNQ Solutions, LLC, a professional organizing company in metro-Atlanta that works with both residential and small business clients. Jonda S. Beattie is a Professional Organizer, presenter, and author of an organizational workbook. Jonda S. Beattie is a former elementary special education teacher and a former Lead Teacher of Special Education with a Master's Degree in Special Education. She is the owner of Time Space Organization, a consultancy in metro Atlanta that works with both residential and small business clients. Published by New York City-based Page Publishing, Diane N. Quintana and Jonda S. Beattie’s tidy tale is a great read with organizational tools and tips to help children succeed in organizing and tidying their rooms without the struggle. Benji is an average, active five-year-old little boy. He loves to play in his room. Sometimes his room turns into a real mess. Benji doesn't know where to begin when his mother asks him to pick up his room. Read to find out how Benji's mother helps him accomplish this seemingly overwhelming task. The authors took some basic organizational strategies and applied them to the common task of picking up a room. Readers who wish to experience this helpful work can purchase “Benji's Messy Room” at bookstores everywhere, or online at the Apple iTunes store, Amazon, Google Play or Barnes and Noble.